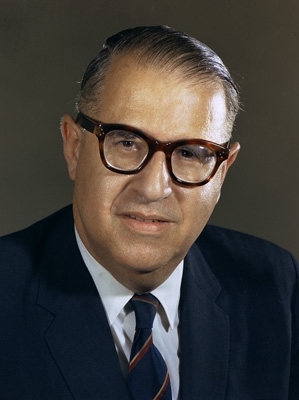 Abba Eban (Hebrew: אבא אבן‎, born Aubrey Solomon Meir Eban) was an Israeli diplomat and politician. A brilliant orator, Eban served as diplomat, government minister and Member of Knesset. As Minister of Foreign Affairs, he sought to consolidate Israel�s relations with the United States and secure association with the European Economic Community. Before and after the Six-Day War, he led Israel in its political struggle in the UN. Abba Eban was a member of the American Academy of Sciences. His books include Heritage: Civilization and the Jews, Promised Land, My Country: The Story of Modern Israel, Abba Eban, Voice of Israel, The Tide of Nationalism, My People, the New Diplomacy, Maze of Justice, Personal Witness, and, in 1998, Diplomacy for the Next Century. He was chief consultant and narrator of the nine-part television program Heritage, and editor-in-chief and narrator of the five-part television series Personal Witness: A Nation is Born. He completed The Brink of Peace, a film on the Middle East peace process for the PBS television network in the U.S. He received the Israel Prize in 2001.